There are endless numbers of hotels in Nha trang. Many good hotels have their own swimming pools usually situated on the roof. The prices are certainly much lower than in many other countries and therefore a lot of people can afford even a 5 star hotel. There are so many hotels in Nha Trang that no matter what your budget is, you will find something for yourself. There are even rooms for only few dolars. For those who want the best quality accomodation, Nha Trang has to offer more than just a hotel. There are few resorts, but most of them are situated many kilometers outside the city. This is one of the most beautiful places in whole Vietnam, but remember White Sand Resort is completely outside Nha Trang, north of Nha Trang . It takes around 1h30min to get there from the airport and there is nothing around this place. You will not be able to visit the city without another 45 min by taxi, one way. Everythig depeds what you want to do. For relaxing far away from the city noise, it is a place cetainly worth a recommendation. This resort is situated 100km north from Nha Trang airport. Many tourists book this resort without knowing it is so far from the city. The taxi costs can be very different and tourists report paying between $ 25 and even $ 150. Depends how honest the taxi driver is. The journey takes between 1 and 2 hours. This is another beautiful resort, but also situated outside the city. Diamond bay is south of Nha Tang and therefore it is much closer to the airport. It takes 10 minutes driving from the city centre and 20 minutes from the airport. 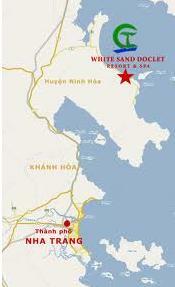 There is a shuttle bus between Diamond bay resort and Nha Trang city. This resort is situated in the heart of Nha Trang. Beautiful swimming pool for guests and the private beach just oposite. Ngoc Sang Hotel a brand new modern 2 star deluxe hotel. Even though it has only 2 stars, but tourists on many websites leave very positive comments. Ngoc Sang hotel is very short walk to the centre of Nha Trang city, near entertainment, shopping area, and 30m from the Beach. The hotel has both sea and city view, rooms have air condition and water is heated with solar panels, rooms have satellite TV. The hotel has a private beach, spa, outdoor pool, children's pool, steam room, sauna, children's club and fitness facility. All rooms have air-condition, cable TV, hair dryer, fridge and Wii-Fii. This hotel also has a restaurant and offers free airport transfer..
All rooms have air condition, cable TV, balcony, hair dryer, safe, iron (on request), private bathroom, shower and bathtub, fridge, Wii-Fii internet. The Light Hotel has an outdoor pool and a spa tub, 2 testaurants poolside bar, a night club. All rooms have air-condition, coffe/tea maker, hair dryer, safe, TV, Wi-Fi internet. 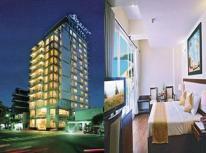 Yasaka Saigon Nha Trang Hotel has a health club, an outdoor pool, fitness facility, restaurant, coffee shop/cafe, parking.